Controller with internal built-in battery. 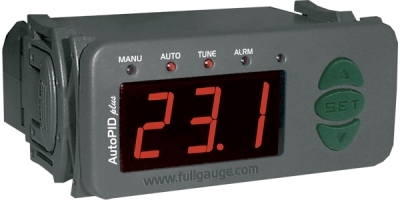 It has four configurable outputs: cooling, heating, minimum ventilation, and alarm and timer (cyclic timer). It has an internal audible alarm (buzzer), a configurable digital filter, and accept three types of sensors: NTC thermistor (- 50 to 105°C), PT100, and PT1000 (- 99 to 300°C). 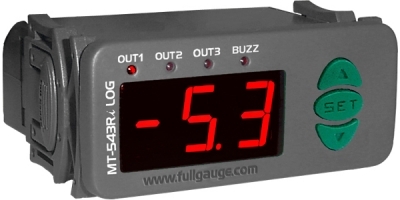 MT-543E Log also has a fifth relay that can be used as a power fault alarm and/or alert. In addition, it features a clock and internal memory (datalogger), which allows storage of the temperature value at specified periods of time, the variation of temperature and the status of the outputs. It also features a built-in rechargeable battery, which allows the data recorded to be kept even after a power fault. It also allows monitoring of HACCP critical points (Hazard Analysis and Critical Control Point) by means of records in the controller’s memory of high temperature alarm, power failure, and digital input. Blood banks, multistage systems of temperature, air conditioners, data centers, vaccine chambers, and industrial ovens (with PT-100).